In Sunday’s game against Brandeis, fourth-year guard Matt Johnson racked up 44 points, tying Derek Reich’s record for most points scored in a single game by a Maroon. In Sunday’s game against Brandeis, fourth-year guard Matt Johnson racked up 44 points, tying Derek Reich’s record for most points scored in a single game by a Maroon. The record had been untouched since the 2002-2003 season. “To score 44 points and [only] take 20 shots is amazing,” head coach Mike McGrath said. The shots Johnson took to tie the record were impressive by themselves. Johnson went eight of 14 from behind the arc, tying another school record for the most three-pointers made in a game. It was Johnson’s second time this season hitting eight shots from downtown. With a malfunctioning public address system before the game and technical difficulties with the online broadcast, it seemed as if the only thing that was going right was the Maroons’ playing. Chicago started off on a 9–0 run before Brandeis made a comeback. The Judges shot 46.9 percent from the field and 36.4 percent from behind the arc, resulting in a 42–42 tie at halftime. 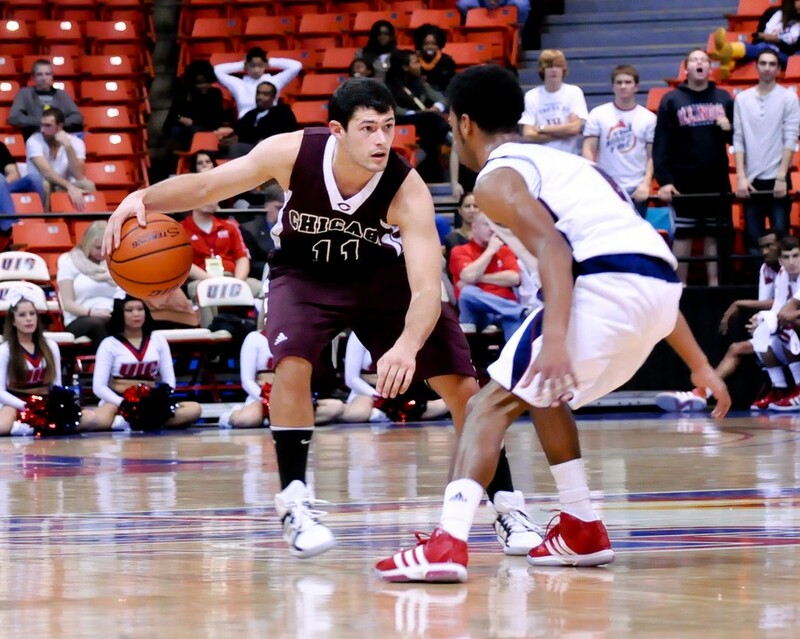 The Maroons relied on Johnson for their scoring, as he was 6–9 from the field and 4–7 from behind the arc. Johnson’s scoring helped the Maroons build a 67–55 lead with 7:17 left in the game. Brandeis was able to come back in part due to Judges guard Vytas Kriskus’s 31-point shooting performance. Unfortunately for Johnson, however, his scoring performance was overshadowed by Brandeis’s come-from-behind victory. With 1.4 seconds remaining in the game and the Maroons (9–7, 2–3 UAA) up 80–78, the Judges (9–7, 3–2) inbounded the ball from half court to guard Ben Bartoldus, who stood next to the basket. Being closely guarded by second-year guard Derrick Davis, Bartoldus’ shot hit the backboard and sailed over the rim. Brandeis guard Tyrone Hughes followed the shot, however, and tipped it in as time expired to send the game to overtime. The Judges outscored the Maroons 17–9 in overtime to give them the 97–89 win. Chicago’s heartbreaking loss came after losing to NYU (15–1, 4–1) on Friday, 81–71. The two-game losing streak puts the Maroons in a tie for fifth place in the UAA. Despite a raucous 925 fans in attendance for Beach Night, Friday’s game against NYU did not appear bright at the start. The Violets went on an 18–4 run in the first nine minutes of the game, capitalizing in transition, and on Chicago turnovers (19 points off of turnovers in the first half). It was then that McGrath called a timeout. Following the timeout, fourth-year forward Steve Stefanou scored Chicago’s next nine points en route to cutting the halftime deficit to eight. Coming off the break, NYU guard Kyle Stockmal sunk three shots from behind the arc in the first five minutes to give the Violets a 58–44 lead. “I thought that if we had delivered a punch to start the second half, we would’ve put them on their heels a little bit,” McGrath said. The Maroons cut the Violet lead to 9 with 29 seconds left. In the following possession, Derrick Davis stole the ball and appeared to be primed for an easy layup, but the referees called a foul on the second-year, and the game ended 21 seconds later. The Maroons continue with UAA action on Friday night at the Ratner Center against Emory (15–1, 4–1). Tipoff is scheduled for 8 p.m.